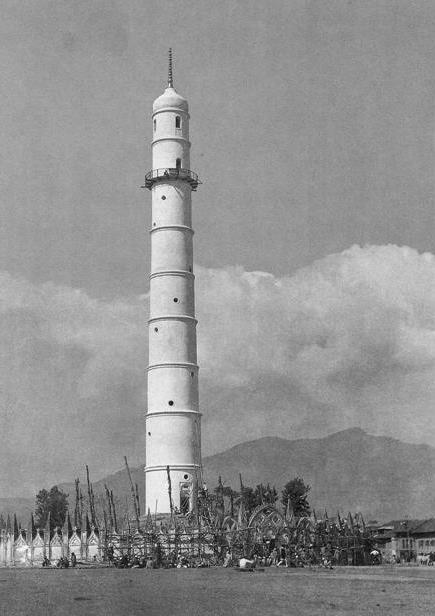 Dharahara in Kathmandu was the tallest building in Nepal and the second such tower built by Bhimsen Thapa. 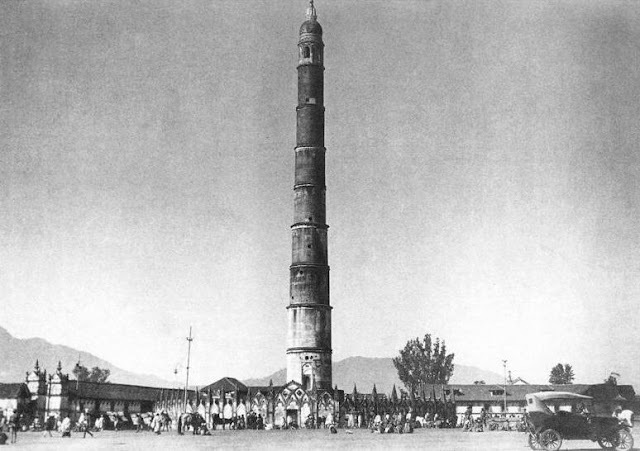 The first tower was built eight years earlier in 1824 and was 11 stories high, two stories taller than the Dharahara. Dharahara is said to be built for Queen Lalit Tripura Sundari, who was the niece of Bhimsen Thapa. During the earthquake of 1834, both towers survived, but the first Bhimsen's tower suffered severe damage. 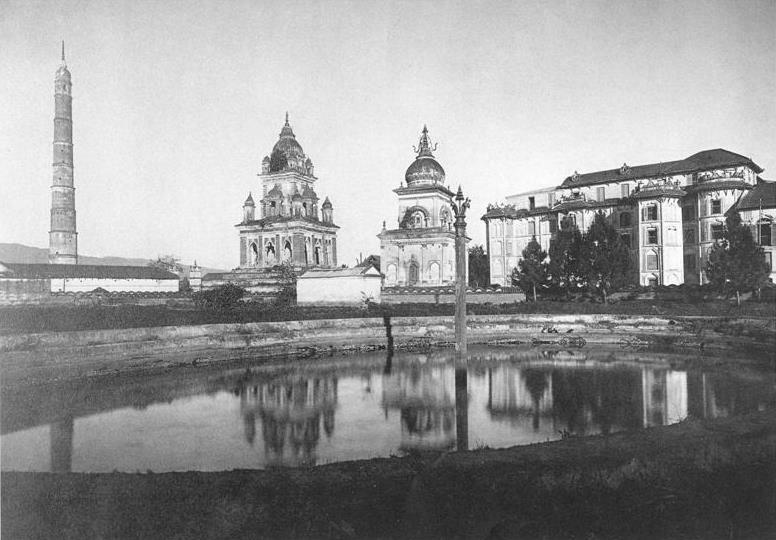 A century later, on 15 January 1934, another earthquake completely destroyed the first tower, and only two of the 9 stories of the second tower remained. The then Prime Minister of Nepal, Juddha Shumsher, subsequently carried out renovation work of the Dharahara tower to fully restore it. After the original Bhimsen Tower was destroyed, Queen Lalit Tripura Sundari's tower became known as 'Bhimsen Stambha' or 'Bhimsen Tower'. Dharahara was constructed for military use as a watchtower. When incidents of national importance occurred, bugles were blown from the top floor of the tower. This was the signal for soldiers to assemble. This tradition of bugle trumpeting continued until the collapse of the tower. On 25 April 2015, another earthquake, with an estimated magnitude of 7.8, hit the region, leading to the collapse of the tower.The earthquake's epicenter was approximately 29 kilometres (18 mi) east-southeast of Lamjung, Nepal. The structure collapsed and only its base survived. The old Dharahara, the Ram Chandra temples and a wing of Bag Durbar from the south-west. Source: Proksch, A. (1995). Images of a century: the changing townscapes of the Kathmandu valley. The pre-earthquake Dharahara as seen from the Tundikhel. After the earthquake in January 1934 Kathmandu was enveloped in clouds of dust. 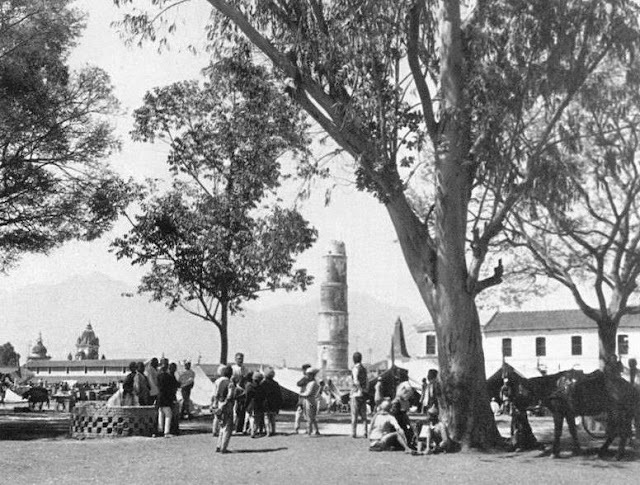 When the dust finally settled, the Dharahara was seen to have survived in a truncated state. Dharahara, the new post office and police box in the center of the intersection. Remains of the Dharahara after the April 25 earthquake. The Dharahara tower remains in the center of Kathmandu now shielded off with steel sheets on .